Getting your business seen on Google is important whether you serve customers in the local area or further afield. Think of how many times you’ve needed a product or service and your first move to find a suitable business is to do a Google search. But, it goes deeper than this. Having a website is great but it’s not good enough. 75% of people never scroll past the first 5 search results on Google. That’s 75% of potential customers who are buying from your competition instead of you. This blog post will detail how to set your business up on Google My Business, optimise your listing and then get your listing to rank well – hopefully above your competition! This blog post is specifically focusing on Google My Business. Google My Business is an excellent free service provided by Google which can really help your business’ local SEO. Think of Google My Business as your online business summary. It can be customised with your address, contact number, business hours, photos, payment types and many more factors which can positively influence your customers buying decisions. If you haven’t already got your Google My Business listing claim it for free here. This blog details two sides to the getting your business found on Google: optimising your Google My Business listing and then carrying out local SEO focused tasks to help your business listing to rank well. Here’s what the blog will cover. Your Google My Business listing has many different sections that need to be completed in order to have a ‘complete’ Google Business listing. This will include things such as your business name, category, location, contact details and much more. This is important for two reasons, the more complete your profile is the better it’ll be for your local SEO since Google will be able to understand whether your listing is relevant for certain key term searches. Also, it helps prevent your competitors changing your listing. On your Google My Business listing, there’s a button which says ‘Suggest an edit’. This button can be pressed by anyone viewing your listing. Users have the power to change vital pieces of information. So be sure to check in regularly to ensure your listing details are correct. Google My Business posts can be viewed as mini adverts which are shown on your Google My Business listing. Google posts are very easy to create and can be done in just a few clicks. You can add text, a button and an image too. Don’t get too bogged down with knowing what to post – look at it as another social media page/account. Post relevant content which will educate or entertain your audience. You can even post special offers! Posts stay live for 7 days after being published. Google does however regularly send notifications to encourage you to post more often. Why spend time posting on your Google My Business listing? It’s a great opportunity to stand out from your competitors. When users search for your business type they’ll be met with several options. If they flick through a few of the Google My Business listings and see your business has been regularly posting content which they’re interested in it’s a great opportunity to build trust and rapport instantly. This would likely result in them contacting you instead of over your competition. The booking button feature is excellent for businesses who take bookings or appointments. For example, if your business is a barbershop your customers can find your business and book a slot in just a few seconds. This feature does rely on having a booking or scheduling software supported by Google. You can see if your scheduling software is supported by Google here. Google’s messaging feature is incredibly handy for a lot of business owners as well as users. 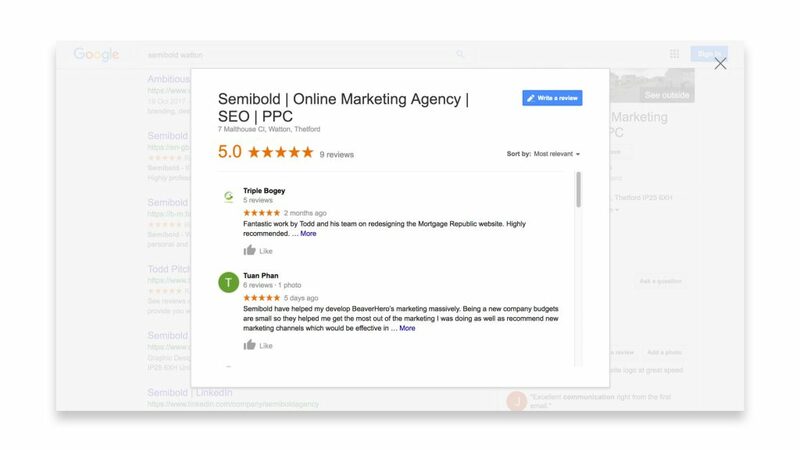 The messaging feature allows for potential customers to send you text messages through your Google My Business listing. Even better, you can set up a direct response message which people will automatically receive when they send you a message. For some people, such as those in the trades who’re constantly on the go and receiving texts and calls all day long getting messages through Google My Business may go forgotten about. A great way to counter this is to download Google’s Allo app. This is a simple app which diverts messages that come through your listing to the app, rather than directly into your messages app on your mobile. Then, you can set a short amount of time each day to reply to these messages separately. It also helps you measure how effective your Google listing is! Google My Business also has a section for Q&As about your business. This can be really handy for potential customers as well as good for your local SEO. It’s very simple, people who land on your listing are able to ask questions about your business. This makes the lives of potential customers easier and gives you an opportunity to impress potential customers with your response. You can use the questions you’ve been asked as a way of determining what information should be made readily available across all of your marketing including adding the information to your Google My Business listing. For example, if you’re a plumber and you’re asked ‘Do you do 24/7 call outs?’ You know this is probably something other potential customers are wondering, so answer this question in all of your marketing. Google have stated up-voting (similar to liking) a question that’s asked can make it more visible. So, in the example above, up-voting a question like that can make it visible to other potential customers viewing your listing. We all know how influential reviews are in today’s online world and Google My Business is arguably one of the more important places to ensure you get good reviews. When viewing a Google listing in ‘basic’ mode you’re likely to see a feature image, telephone icon, directions icon, business category and reviews. Having a strong portfolio of reviews can be the difference between a potential customer choosing your business or a competitor. On top of this, reviews impact search result rankings. One of the most influential stats around this subject is that 97% of consumers read online reviews for local businesses. Also, positive reviews make 73% of consumers trust a local business more. When you receive a review, ensure you respond to the review. This applies whether it’s 1 star or 5 stars. It shows you’re actively attempting to understand and improve your business based on feedback. Also, don’t worry about negative reviews. It’s impossible to please everyone. Just reply in a professional manner and state you’ll use their feedback to improve. This professionalism will be appreciated by other potential customers. Adding photos and videos to your Google My Business listing provides an opportunity to make your business seem ‘legit’. You can populate your listing with photos and videos of your team, office and other things relevant to your business. This results in potential customers having no doubts about your business or what to expect. Also, it can be a way to sell the human side of your business. When people land on your listing all they see is contact information and buttons. Adding media content is an opportunity to sell your business on top of the standard information available. Don’t overthink this too much. You don’t need a professional photographer or videographer to create media for your Google My Business listing, just use your mobile phone! One thing to ensure is that all media you upload to your listing is at your place of business. That’s what Google My Business is all about after all! Your Google My Business listing also includes a description section in which you have 750 characters to summarise what your business is all about. However, despite having 750 characters you’ll only see a short amount on the listing unless your potential customer clicks ‘read more’ on your description. So get the important stuff in first! “Semibold, located in Watton, Norfolk, but servicing both local and national clients. You can see how we’ve included our key services, keywords and even CTAs throughout. Now, that’s not perfect by any means. There’s probably no such thing as a perfect description for your listing. But, try new things, tweak it and see what works best! Now you’ve got a fully optimised Google My Business listing, it’s time to improve the ranking of your listing. This is where you’ll see the real results! There’s a few techniques and tasks that you can carry out to help positively influence Google’s ranking algorithm. If you’ve fully optimised your listing you’re likely ahead of a lot of your competitors already. Now it’s time to push further! NAP stands for name, address, phone. Your NAP should be consistent across everything online! Your directory listings, social media, website content. All of these consistent indexed NAP listings show Google your information is correct and trustworthy. A huge factor in local SEO is building relevant citations. Citations are listing your business on online directories. Your local chamber of commerce (e.g. Norfolk Chamber of Commerce) and sites like Yell. Start building out your citations on trusted directories but remember your constant NAP! How many categories have your added on your listing? Did you know you could have multiple? Adding more relevant categories to your listing can be really effective. Our primary category is ‘marketing agency’ but we have additional categories in ‘internet marketing service’, ‘web designer’, ‘graphic designer’ and so on. This helps mop up the other searches potential customers may be making that your listing wouldn’t already fit into. As mentioned above, reviews are great for getting people to trust your business as well as helping your listing rank well. Moz attributes ‘review signals’ as a 15.44% ranking factor in your local SEO. This means that reviews make up 15.44% of the factors that influence your local SEO rank. So, encourage people to review your business on your listing, it helps build trust with potential customers and influences your rank. Embed a Google map on your website. If you look on our contact page you’ll see what is meant by this. This provides ‘proof’ to Google that you’re located at the address you’ve chosen in your Google listing. 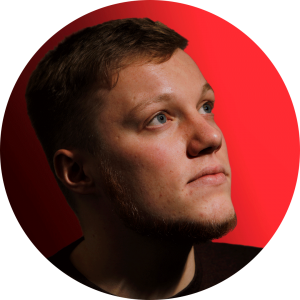 This is something you or your web developer would be able to do fairly quickly. Failing that, we’re more than happy to help out. A backlink is a link from a website that goes to your website. An example of this is your website listing on the directories you’ve been listed on. Backlinks are a key part of your overall SEO, not just your local SEO. 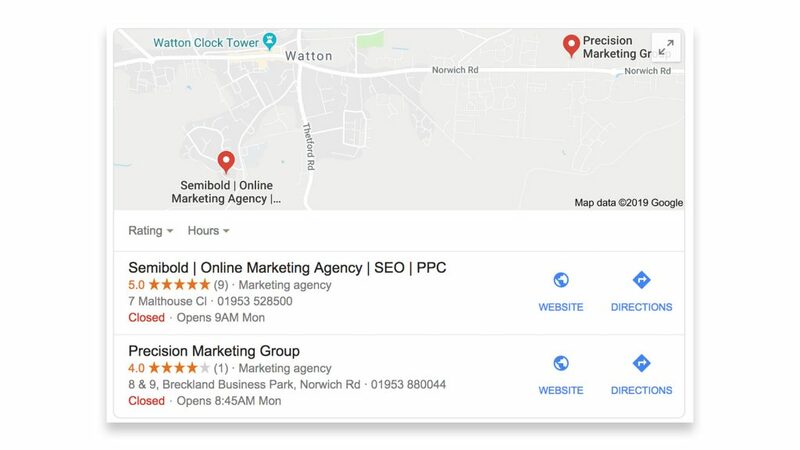 This blog should give you all the information you need to create your Google My Business listing, optimise it and employ local SEO techniques to help your listing rank well and get your Norfolk business found on Google. Local SEO takes time and consistency. As with SEO and all marketing you have to consistently work at it to see real results. Working on the SEO for your Norfolk business can take time, but it can be very much worth the effort. 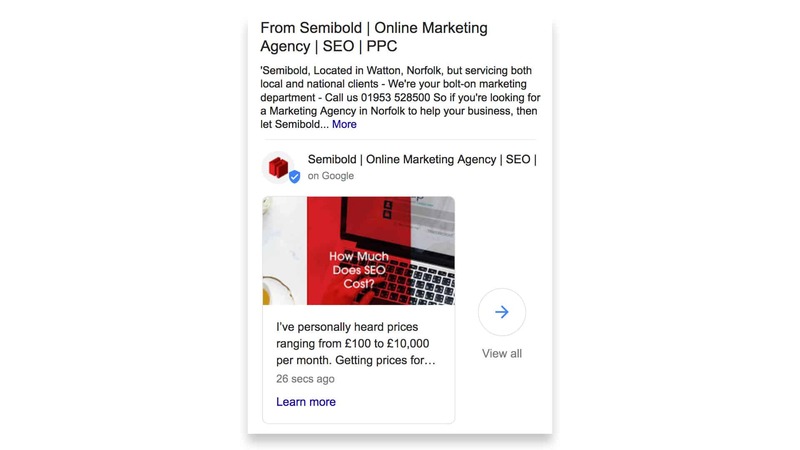 So, if you want to get more customers for your Norfolk business through local SEO try out the tips in this article or get in touch and we can do it all for you with Norfolk local SEO packages starting at £228 per month. P.s. Picture this, you’re busy running your Norfolk business, you get an email ping. It’s a new customer enquiry that’s come through your website. A new enquiry that you’ve done absolutely no leg work for. We’ve been making it happen for you. Work with us and that could be you. Want to get more effortless enquiries through Google searches? Fill out the form below and press send to get started on your journey to getting more customers and enquiries through local SEO. We’ll be in touch to offer marketing advice and/or a free, no-obligation quotation.